Why you should buy a carbon monoxide detector, right now. So after my April the 1st ‘warning’ about PHMEA, this one is for real. I mean really. Don’t ignore this and, more importantly, make your kids read it if they’re living away from home as well. This might just save your life, or theirs. As I write this tragic story is being reported by most major news organisations: Kelly Webster and Lauren Thornton die on Windermere boat. It appears that they died of carbon monoxide poisoning. Stories like this turn up with terrifying regularity. The dangers of carbon monoxide are on the GCSE Chemistry syllabus, and every year before I teach it I search for ‘carbon monoxide’ on google news. And every year a list of recent, tragic stories appears. And so on. It’s always like this. And the terrible thing is, these incidents are completely avoidable. So what is carbon monoxide and where does it come from? It’s a simple molecule, made of two atoms: carbon and oxygen, CO. Like its more familiar cousin carbon dioxide, it is colourless, odourless and tasteless. Unlike carbon dioxide, it is deadly. Why? Because it bonds, very strongly, to the iron in haemoglobin. Haemoglobin is the molecule in your blood, specifically in your red blood cells, that transports oxygen around your body. Without this mechanism, oxygen can’t get from your lungs to your muscles, or your brain, or any of those other important bits and pieces. Without oxygen, everything stops working pretty quickly. Normally what happens is that oxygen bonds to the haemoglobin, and this tidy little package (in the red blood cells) gets transported to wherever it needs to go. Then, crucially, the oxygen is dropped off so that it can get to work doing useful stuff, namely, respiration. The trouble is that when I say carbon monoxide bonds strongly to haemoglobin, I mean REALLY strongly. So strongly that it’s a one-way process. Oxygen can no longer attach to that molecule of haemoglobin, and ultimately that red blood cell becomes useless. If that happens to enough red blood cells, your oxygen-transport system stops working, like a tube train network where all the train doors are permanently jammed closed. And then? Essentially, you suffocate. If you’re exposed to a tiny amount of CO, for example from smoking a cigarette (bad habit, don’t do it), a few cells are affected but you survive – in the short term at least – because your body helpfully replaces your red blood cells with shiny new ones every 48 hours or so. But if you’re exposed to a slightly higher level, and it doesn’t have to be that much, over a sustained period of time you will be poisoned. It only takes 20-30 ppm (parts per million) over a period of a few hours. 2000 ppm for one hour will leave you unconscious. Unhelpfully, the symptoms in the early stages are not unlike viral symptoms. They include a headache, feeling sick, feeling tired and foggy-headed and having stomach pains. I say unhelpfully, because what would you do if you started getting symptoms like this? You’d probably take a couple of paracetamol and go to bed. And that’s where the trouble begins, because the CO is probably in your house. And you’ve just shut the killer in with you. How did it get there? Well carbon monoxide forms when carbon-based fuels burn in limited oxygen. Carbon based fuels include coal, wood and natural gas. If you have a gas boiler, a wood stove, or even an open fire, you need to make sure you’re not in danger. In the case of Kelly Webster and Lauren Thornton the problem appears to have been a faulty generator on their boat, which was probably burning diesel or petrol (gasoline). If these fuels burn in plenty of oxygen, the only things that are produced are carbon dioxide and water. As I mentioned, carbon dioxide is fairly harmless (obviously if you breathe in a LOT of it you’re in trouble – it will lead to something called hypercapnia – but this is very unlikely to happen under normal circumstances). But these fuels burn in restricted oxygen, carbon monoxide forms. Here are a couple of equations which make it quite clear. I’m using methane, CH4, here – the primary ingredient in natural gas, because it keeps things nice and simple. Look down the list: the big numbers in front of the CH4 and the H2O are staying the same each time. The numbers in front of the oxygen, O2, are going down, and as they do the products on the right hand side are changing. We start at the top with just carbon dioxide CO2, and water. 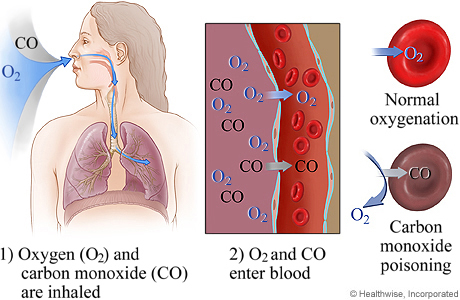 If there’s a bit less oxygen we start to get carbon monoxide, CO. If there’s less still, we also get a bit of pure carbon, C, which is essentially soot. So carbon monoxide forms when fuels burn in limited oxygen. Normal air is about 20% oxygen, so usually there should be more than enough. That is, if your boiler is maintained properly and your chimney flue is clean and clear. And that’s the key. Make sure it is. If you have an open fire, get that chimney swept by a professional. If you have a wood stove, keep it clean, check the seals and, again, get the chimney swept. Generators should be regularly serviced and checked. If you have a gas boiler get it serviced yearly by a Gas Safe registered engineer. Not your mate’s mate who knows a bit about boilers. A proper Gas Safe engineer. I realise this costs money, but this is your life on the line here. If you’re renting it’s your landlord’s responsibility to get all gas appliances, including the boiler, inspected every year. By law they must also provide you with a copy of the CP12 Gas Safety Certificate. Ask for it. Make sure your recently-moved-out son or daughter has asked for it. If they don’t provide it, insist. If you’re not sure it’s legitimate, get it checked out. If you have trouble, report the landlord. They can be given a hefty fine for not following this procedure. Regular servicing is important but it is possible that a fault could still occur. The crucial thing, the thing that could simply and cheaply save all of these unnecessary tragedies, is this: get a carbon monoxide detector. It should be marked with EN 50291 and also have the British Standards’ Kitemark or another European approval organisation’s mark on it. Carbon monoxide alarms usually have a battery life of up to 5 years, but it goes without saying that you need to check regularly as you do smoke alarm batteries. A good alarm can be purchased for £15-£20. It’s an expense, but it’s worth it – this piece of kit could save your life. If your child is off to university and living in rented accommodation, buy them one and make sure they have a supply of batteries. Amazon sells them. Why not order one right now? Don’t assume that just because it’s a new boiler (or other appliance) it’s safe. New boilers can have problems too. They can be badly fitted, and sometimes even a new boiler develops a fault. Get that alarm. In the UK 50 people die every year from carbon monoxide poisoning, and every single one of those could have been prevented if they’d had a working alarm and paid attention to it. Every single one. It’s really simple. Don’t be one of those news stories. Get a detector. This entry was posted in Dangerous chemicals, Everyday chemistry and tagged Carbon monoxide, carbon monoxide alarm, carbon monoxide detector, Carbon monoxide poisoning, Gas Safe, haemoglobin, landlord, oxygen transport, red blood cells, renting by katlday. Bookmark the permalink.